Prepare a pie pan or a round cake pan with non-stick spray. Baking spray, with flour already in it, works best! Unroll the crescent roll sheet. I noted to use Pillsbury crescent rolls as these tend to work better with removing the seams. Push all of the seams together, making one large, solid sheet. In a small bowl, combine the sugar and cinnamon, set aside. Brush the dough with the melted butter. Generously and evenly sprinkle the cinnamon mixture over the entire sheet. Top with sprinkles! As little or as much as you like, you can’t go wrong. To cut your slices, use a string such as floss or butcher string, tie it around the log and pull tight until a slice has been made. This will prevent your slices from being smooshed with a knife. Do this until you have made 8 slices. 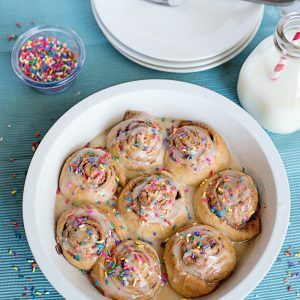 While hot, mix together the topping ingredients, drizzle over the cinnamon rolls and sprinkle away!